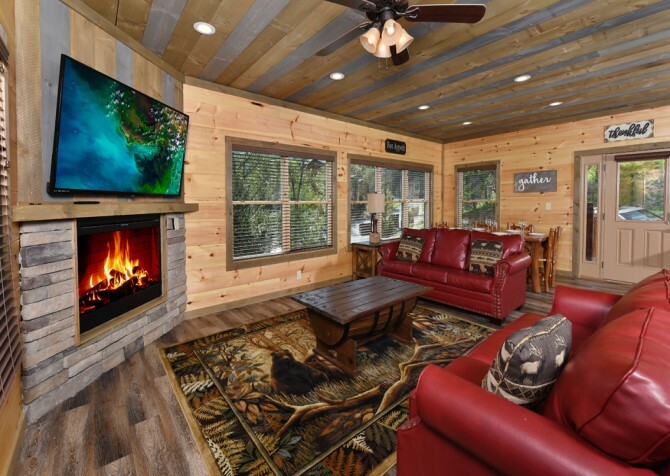 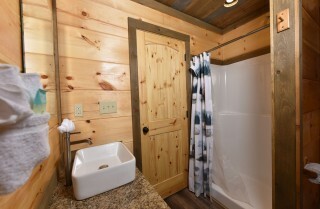 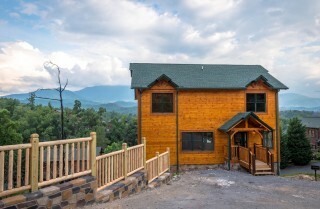 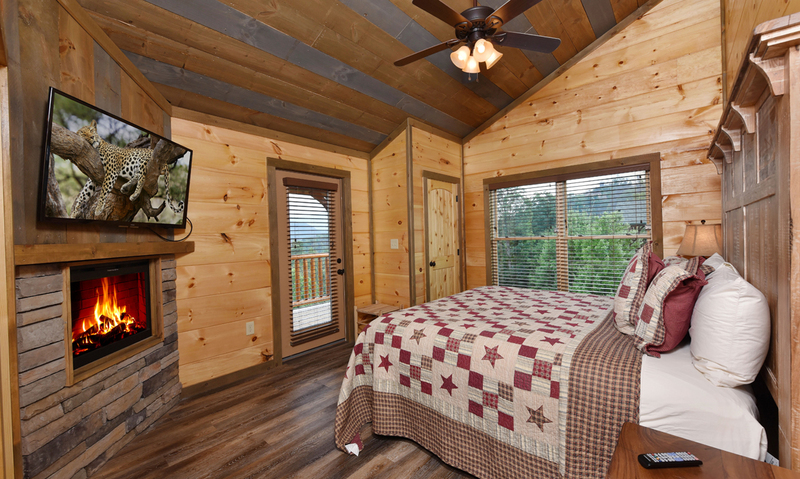 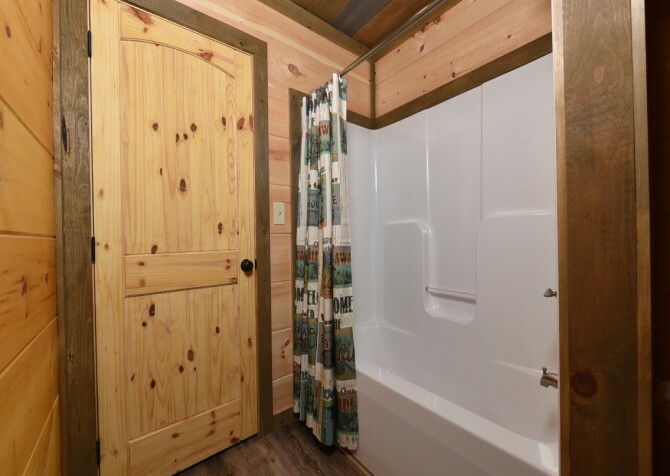 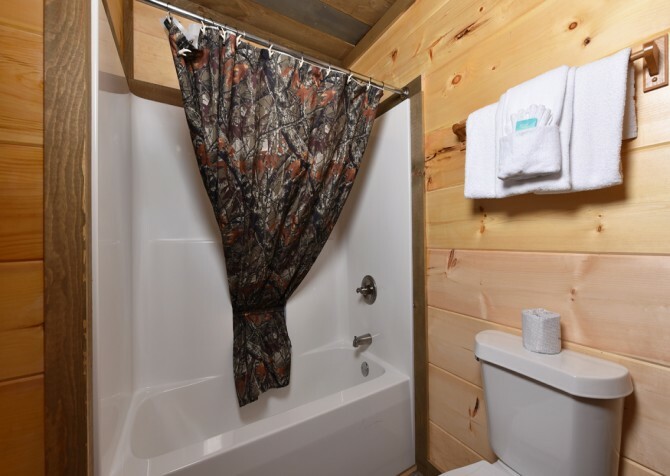 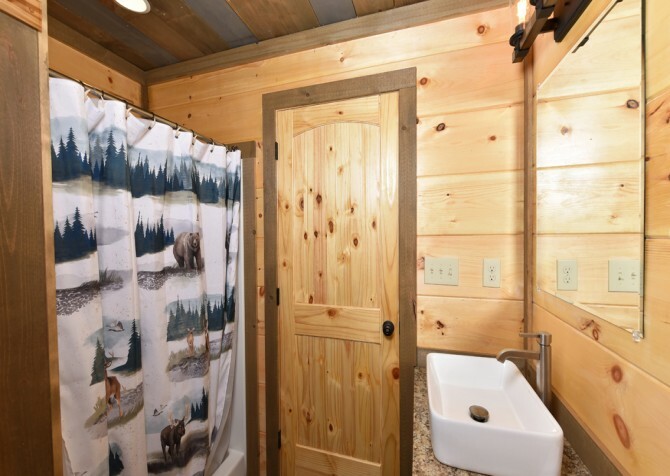 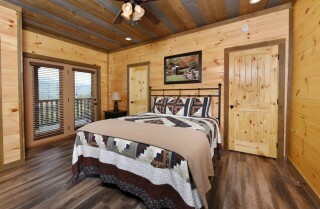 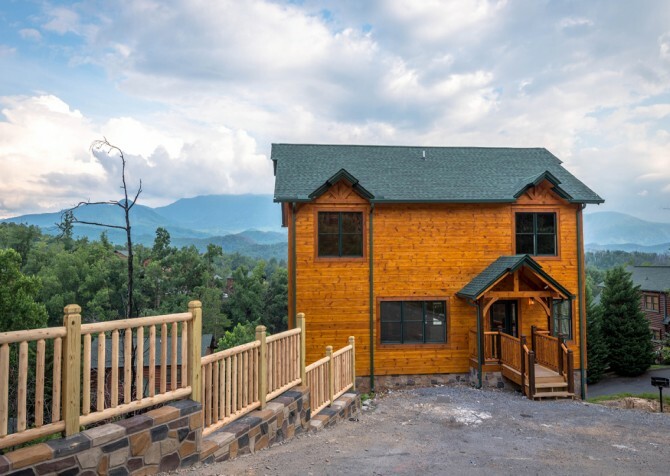 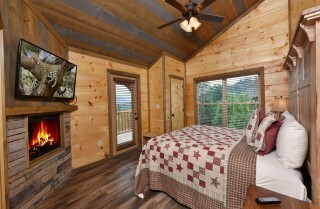 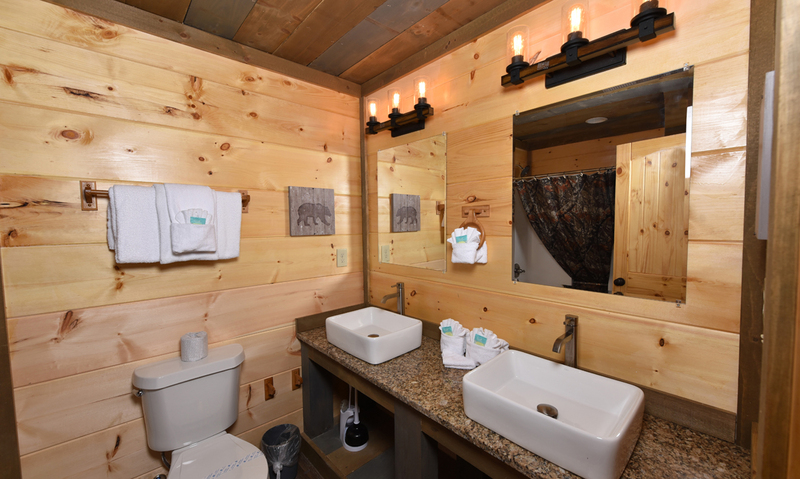 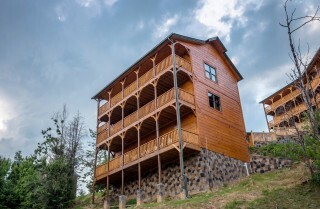 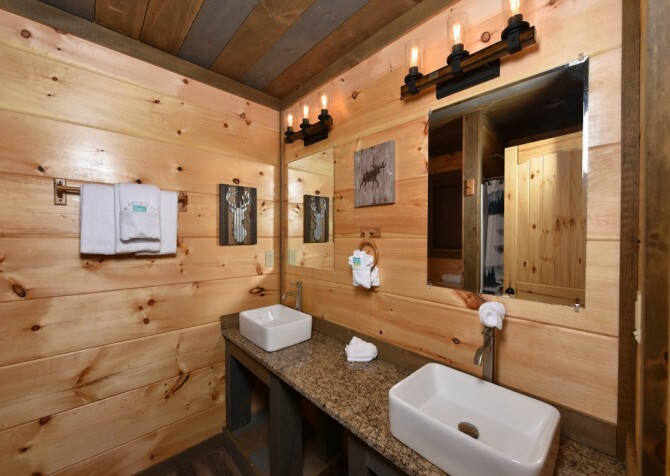 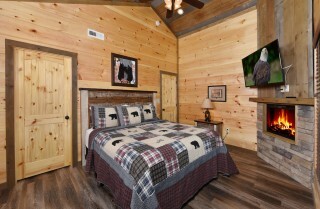 With 4 spacious bedrooms, 5 convenient baths, and space for up to 12 guests, Splash ‘N Views is a beautiful new-construction (2018), 3,500-square-foot cabin — perfect for large family vacations, sweet couples’ retreats, or getaways with close friends — in the premier Gatlinburg Falls Hidden Valley Resort. 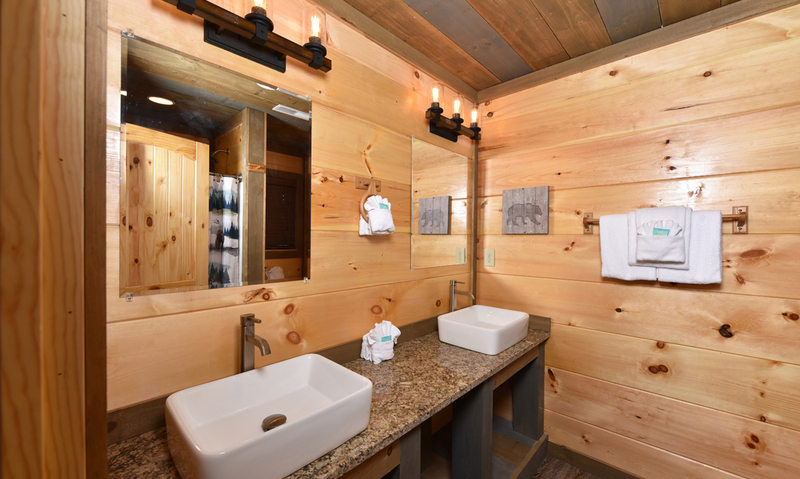 Luxurious inside and out, high-end finishes and stylish mountain décor pair with awesome modern amenities and the conveniences of home for a memorable stay you won’t soon forget. 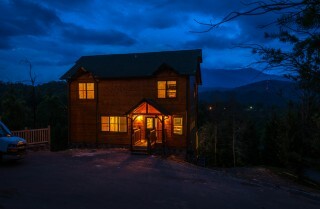 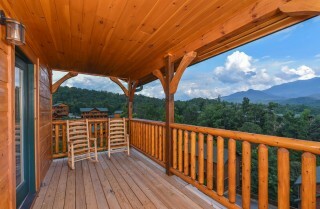 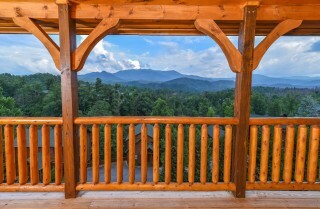 Plus, just a few miles from downtown, this gorgeous mountain home keeps you close to the many great wineries, unique shops, and fun attractions of Gatlinburg! Start with the jaw-dropping views of the Great Smoky Mountains — even from the private indoor granite pool — and the list of impressive perks goes on and on. Spend days splashing around in the privacy of your cabin, without missing out on beautiful mountain vistas or shows on the flatscreen TV. 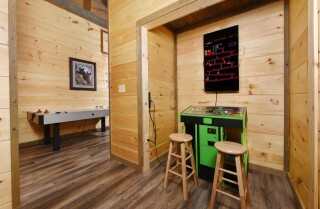 Or spend your afternoon playing Arctic Wind Air Hockey or Donkey Kong, Pac-Man, and more on the 60-game Multicade before grabbing a drink and sitting back with a cold one in the rocking chairs on one of 3 sizeable decks. 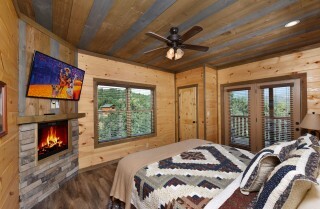 And movie nights are a must with a big screen TV and Blu-ray player — plus flatscreen TVs in every bedroom! 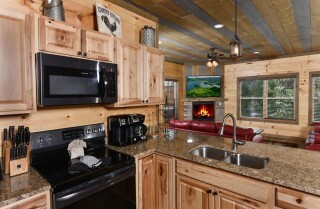 The 5 electric (no heat) fireplaces set a cozy cabin atmosphere, the charcoal grill makes for great BBQ parties, the outdoor hot tub with a TV is perfect for tired muscles after hikes in the Great Smoky Mountains National Park, and the fully equipped kitchen boasts the tools you need to keep everyone fed and happy in the cabin! Add homey conveniences like the complimentary wireless internet and handy washer and dryer, and you’ll never want to leave Splash ‘N Views! 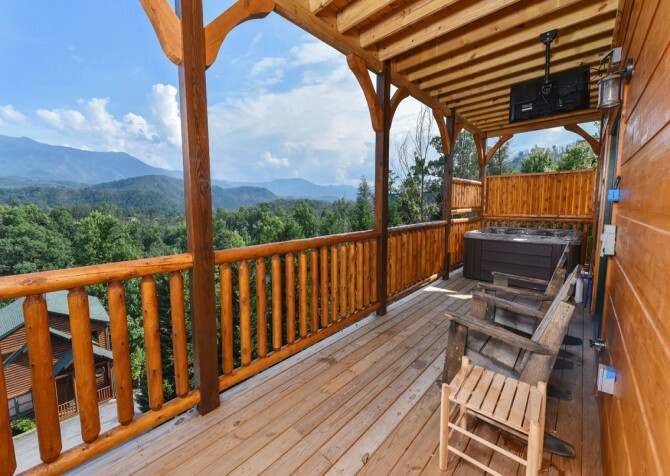 If you need some extra space or have a few groups and want to stay close to each other, check out the sister properties of Splash 'N Views: Views Above the Rest, Cherokee Dreams Lodge, and Unforgettable Views and a Theater! 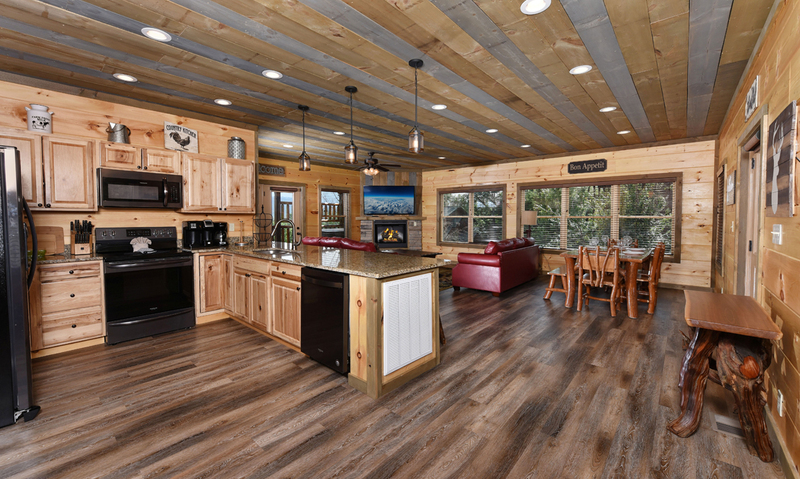 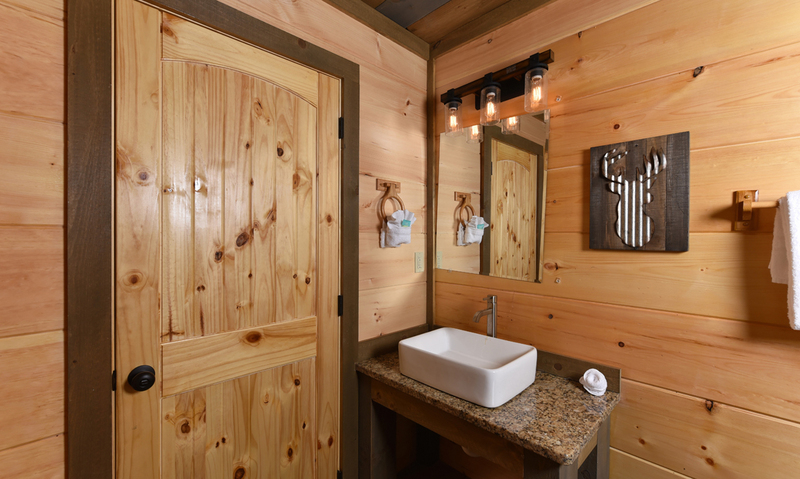 After your travels, head to the living room at Splash ‘N Views, featuring 2-toned wood stains, adding a touch of cool mountain blue to the warm cabin hues. 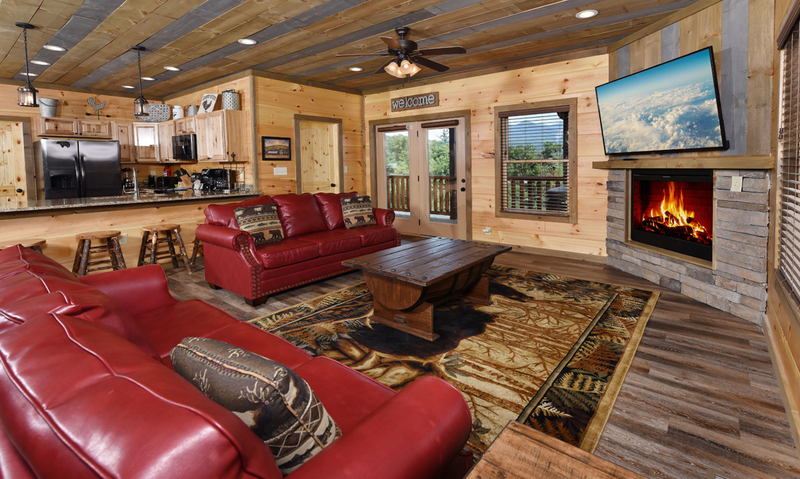 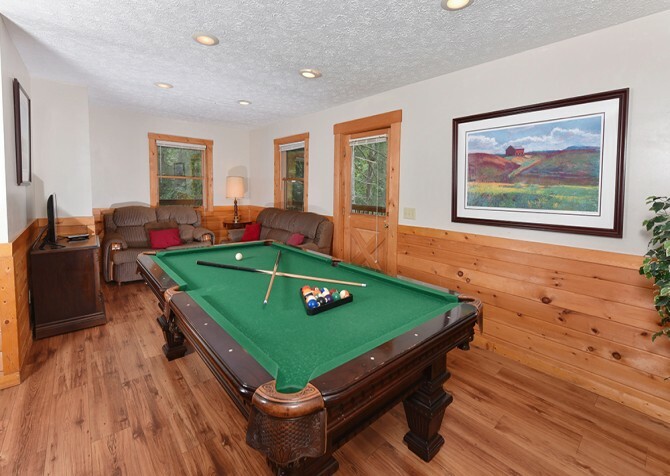 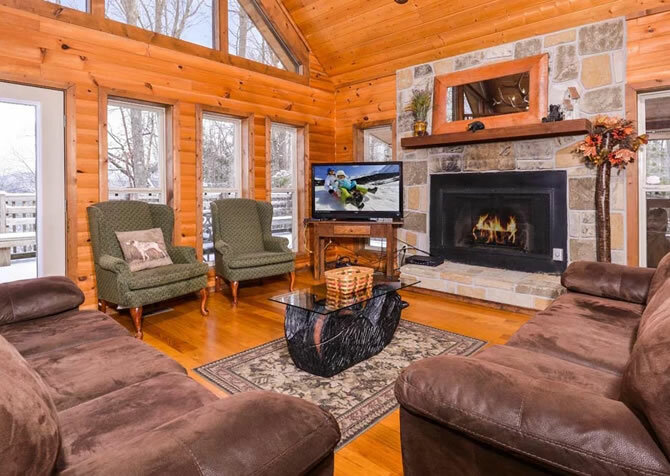 Take a rest on the living room sofas and flip on the whopping big screen TV to catch the big game or open the blinds to breathtaking Smoky Mountain views. When evening arrives, switch on the electric (no heat) fireplace to set the Smoky Mountain mood and grab a good book for a bit of quiet time or bust out your favorite board game on the coffee table for family game night — winner fixes the next round of cocoa with extra marshmallows! Speaking of tasty treats, the fully equipped kitchen is just off the living area, taking full advantage of the open floorplan to bring mealtime seconds, popcorn refills, and midnight snacks closer to you. 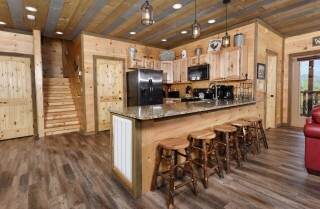 Plus, this kitchen boasts all the tools, sleek appliances, and space — including a breakfast bar for 5 — you’ll need to prepare homemade dishes in a flash! Store fresh ingredients in the fridge, rinse fruits and veggies in the stainless-steel double sink, whip up hot breakfasts on the stove, brown bagels in the toaster, reheat mouthwatering restaurant leftovers in the microwave, and brew a K-cup of joe or an entire pot (to share or not) from the coffee machines whenever you please. Oh, and there’s a dishwasher to keep mealtime messes to a minimum! 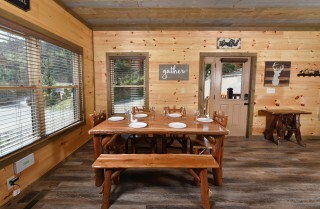 While great food may be key to a successful trip, where you eat matters, too. And at Splash ‘N Views, you’ll have a dedicated place to sit down and enjoy delectable meals and juicy chats with family and friends in the open dining area, harboring a mountain-style wooden table with 4 matching chairs and bench seating. Coupled with the 5 kitchen bar stools plus additional seating in the living area, everyone will have a comfortable place to dine. 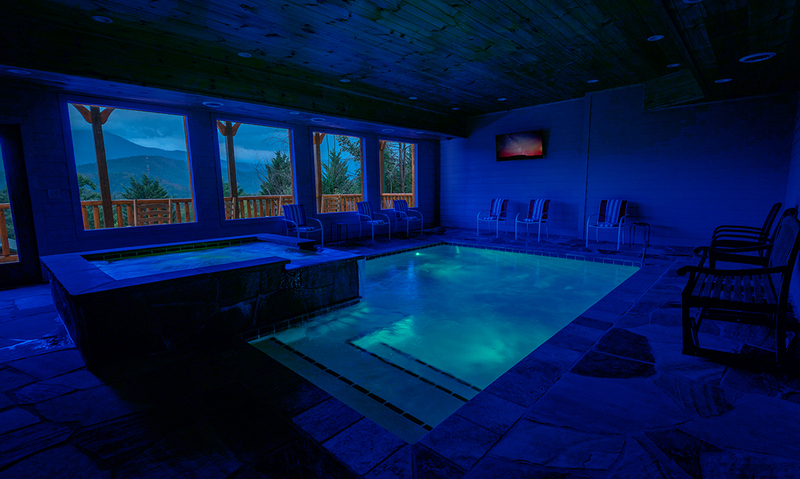 Splash ‘N Views was certainly dubbed right as you take in the stunning Smoky Mountain peaks from the large windows while splashing in the pool room with elegant stone flooring downstairs. 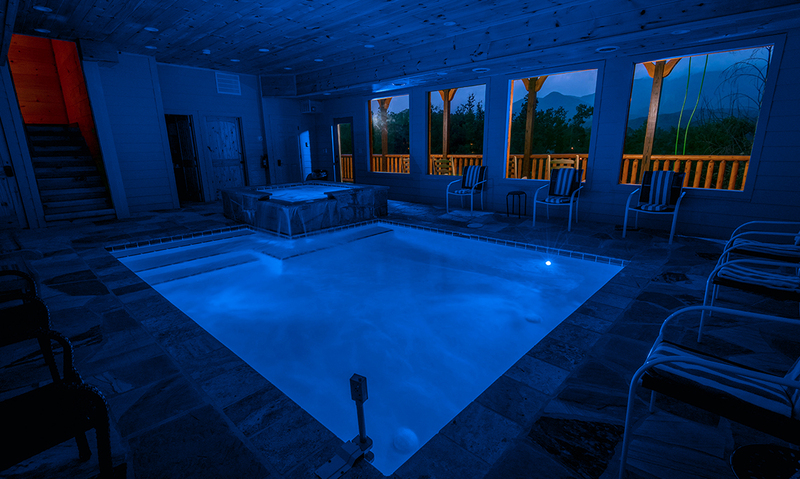 Yep, that’s right — you’ll have your very own private indoor pool with special underwater, color-changing lights! 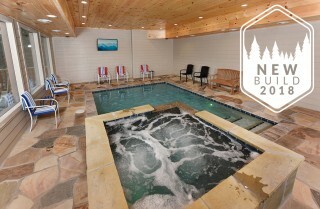 Made of genuine granite, this heated pool is more than a special cabin amenity; it’s a place to relax, unwind, and play. Teach your littlest to doggie paddle in the wading pool, soothe your soul near the waterfall feature, hear the kids (and kids at heart) call out Marco Polo while you relax and chat in the seating areas, or go for a colorful midnight dip in privacy. As a bonus, there’s even a flatscreen TV to keep everyone entertained and a bathroom just down the hall for your convenience! 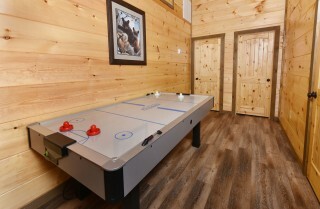 When pool times are paused, head for the epic rec room, featuring Artic Wind Air Hockey and a 60-game, flatscreen Multicade unit with classics like Pac Man and Donkey Kong. 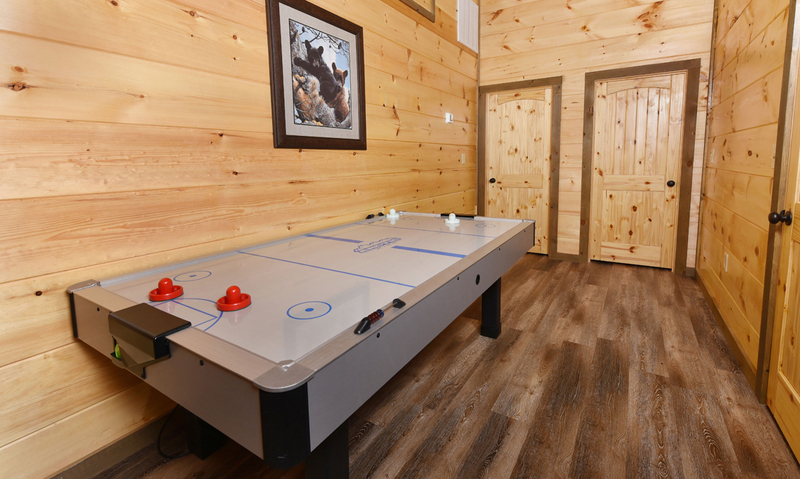 As cool as air hockey is (pun intended), Splash ‘N Views comes well equipped with a ceiling fan overhead to keep the more serious athletes at an optimal temperature. 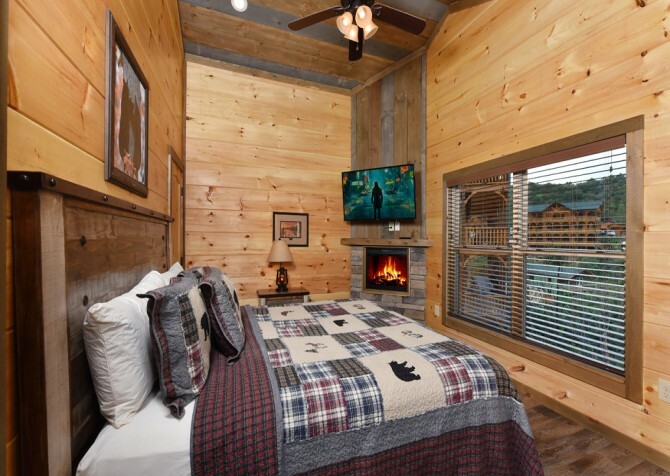 At night, 4 beautiful bedrooms — each with their own electric (no heat) fireplace, mounted big screen TV, ceiling fan, and private bathroom — are welcome retreats. 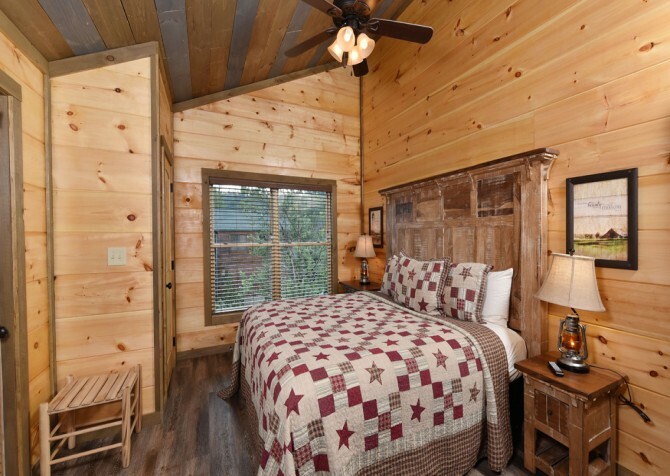 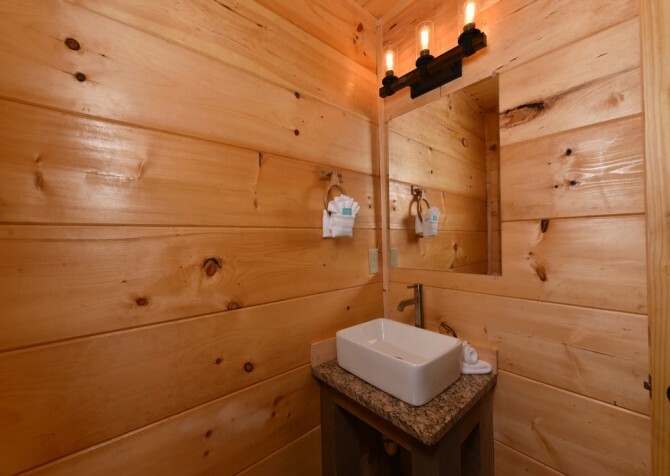 Three bedrooms are spacious king-size suites with direct deck access for morning mountain views, and the other is great for kids or more guests with full-size hickory bunkbeds! 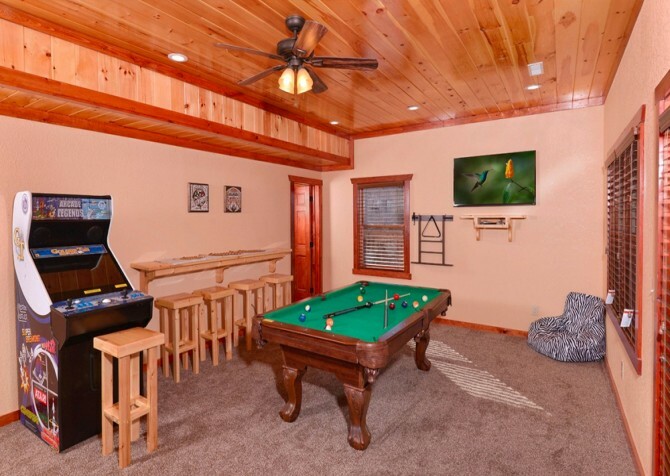 Snuggle with your spouse in a king-size bed, read a romantic novel by the fire, and sneak out for late-night arcade matches in the rec room nearby. 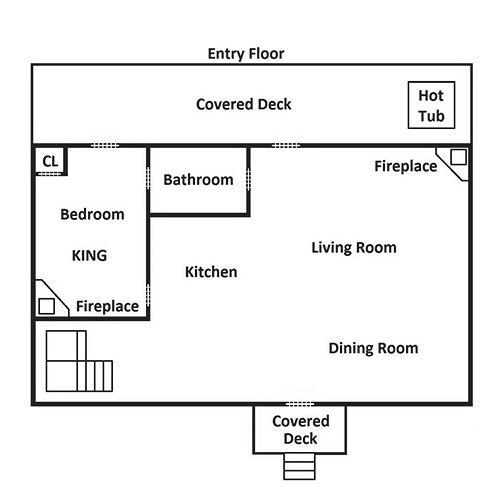 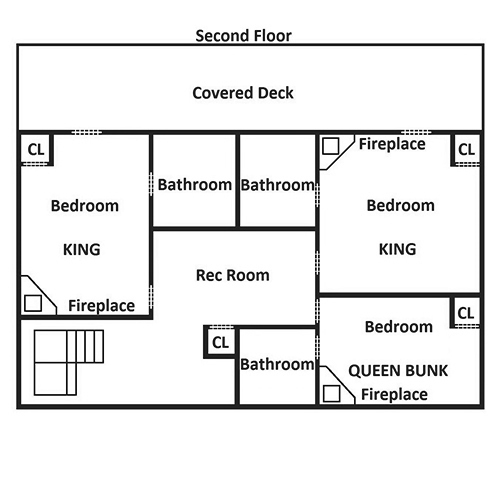 There’s also a queen sleeper in the home for extra space, bringing the maximum guest count to 12 for Splash ‘N Views. 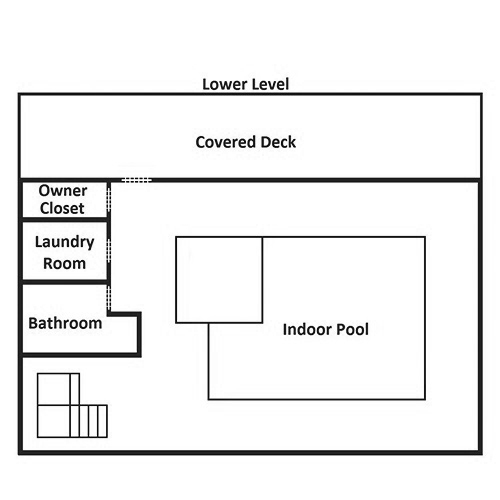 Need even more space? 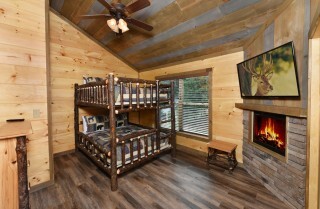 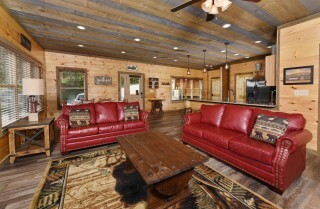 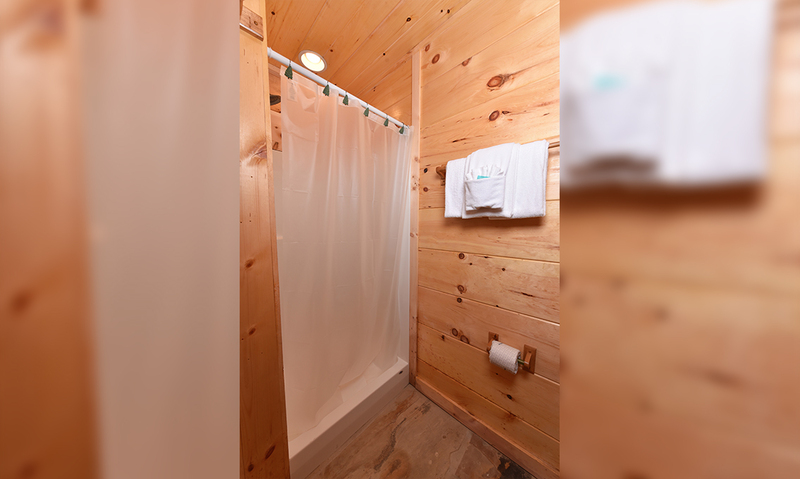 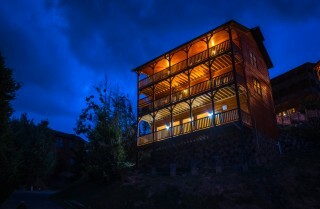 Three neighboring cabins are equally awesome, offering you privacy for multiple families with plenty more space nearby. 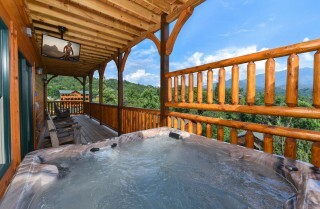 Be sure to check out Views Above the Rest, Unforgettable Views & A Theater, and Cherokee Dreams Lodge just 500 feet away! 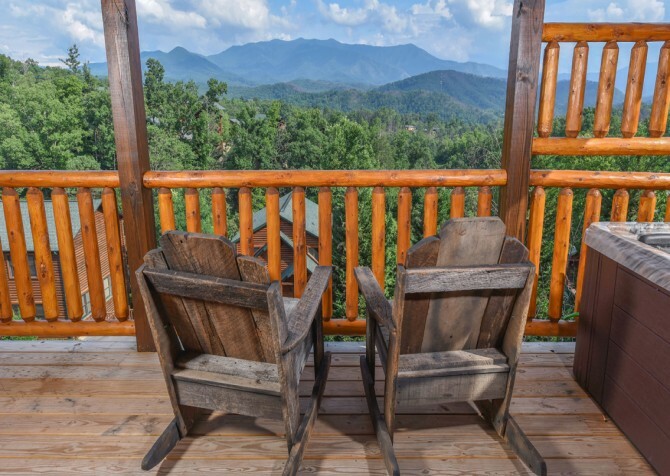 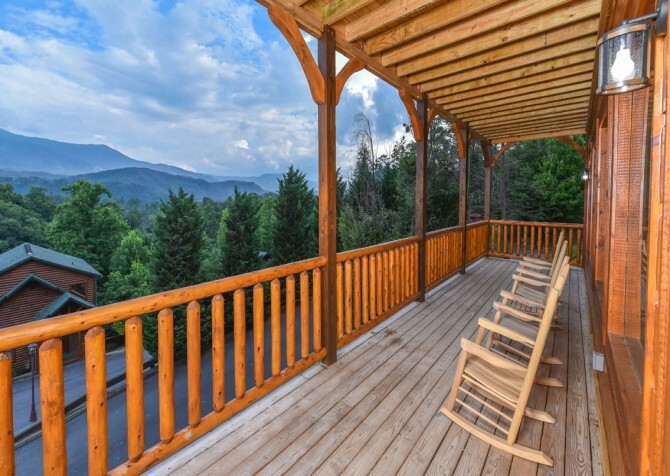 Arrive to the flat, paved driveway with paved, motorcycle-friendly parking for up to 5 vehicles (including room to park a trailer) at Splash ‘N Views, head 3 steps up to enter the gorgeous cabin, and make your way to the 3 spacious decks out back for awe-inspiring Smoky Mountain views. 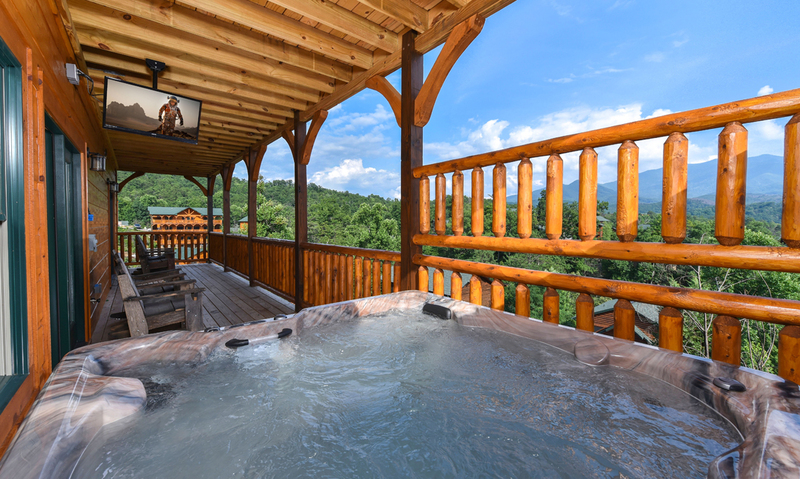 Sway your worries and cares away in the rocking chairs and unwind in the outdoor hot tub, featuring a flatscreen TV. 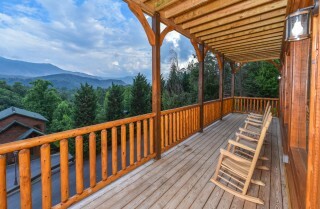 Interested in hosting a barbecue shindig? The charcoal, picnic-style grill is ready and waiting for tender steaks, veggie kabobs, and baby-back ribs! Oh, you didn’t think that was all Splash ‘N Views had to offer, did you? 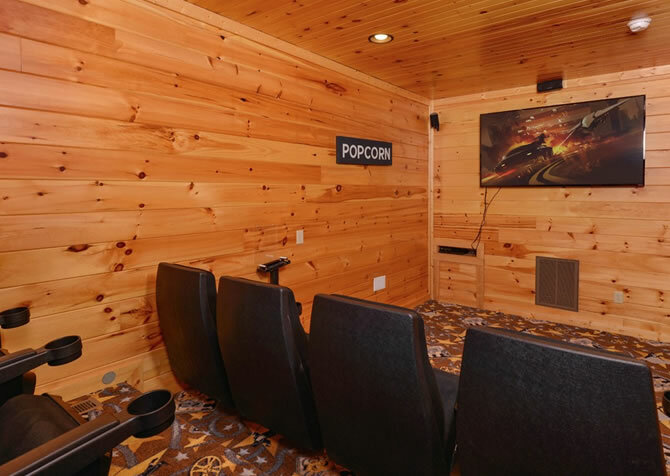 Host movie nights with the Blu-ray player, keep towels and clothes fresh throughout your stay with the provided washer and dryer, and stream your favorite shows via the complimentary wireless internet. 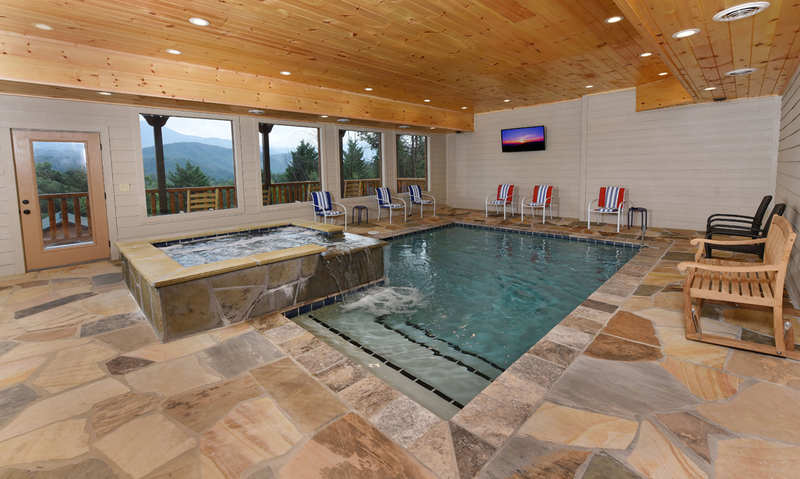 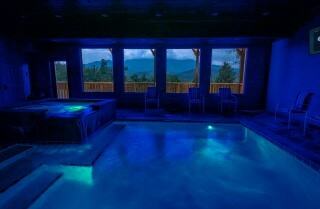 Best of all, this mountain abode is a proud member of Gatlinburg Falls Hidden Valley Resort, which means you’ll have access to not only your private indoor pool at the cabin but also the community outdoor pool at the resort — woohoo! Just when you thought Splash ‘N Views couldn’t get any better, you realize it’s less than 3 miles from downtown Gatlinburg, keeping you close to awesome attractions, gourmet restaurants, quaint shops, and the Great Smoky Mountains National Park! 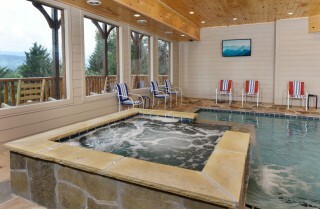 Can get enough underwater fun? Venture to Ripley’s Aquarium of the Smokies, where you can come face to face with Nemo, penguins, sharks, stingrays, sea turtles, and tropical creatures! 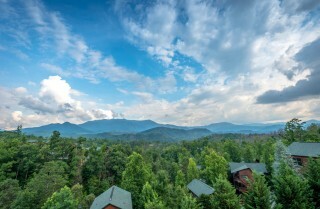 Take your vacation up a notch by heading to Ober Gatlinburg for a full day of amusement park excitement, with ice skating, mountain coaster rides, groovy moves on the dance floor, a wildlife encounter, and more. Soar through the trees over half a mile at Zip Gatlinburg, where you can conquer your fear of heights and enjoy epic forest, mountain, and city views at the same time.